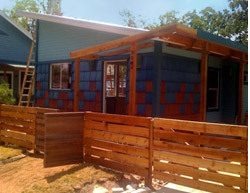 Shelter with spirit works in partnership with other Central Texas non profits to provide grants for shelter renovation projects, which will enable families in need to avail themselves of green building technology. Our organization's charitable purpose is stated in the articles of incorporation as follows, "to partner with non profit organizations which provide shelter construction and renovation for the economically disadvantaged, to provide design and construction solutions grounded in green building technology, and informed by contemporary architectural paradigms." We work with other non profits in identifying and helping families who are interested in using green building technology, and who want to use green building materials as part of a healthier and more socially responsible lifestyle. For example, a family with small children might want to limit their children's exposure to chemicals in the home, so they may ask for help in purchasing low VOC (volatile organic compounds) paints. A family of older adults may be interested in receiving help with energy conserving technology, which would lower their home's monthly utility expense. An example might be an upgrade to a more energy efficient heat and air unit; another low cost option would be to install ceiling fans in the living and bedroom areas. 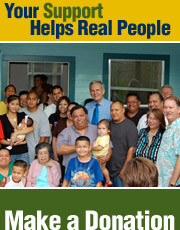 Our organization works with families in the Central Texas area, and primarily in the community of Austin, Texas. The City of Austin has been a leader in progressive, socially conscious programs, like Austin Energy's "Green Builder" program, and also the City's "Xersicape" program which promotes the use of drought tolerant landscaping. 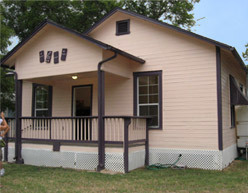 Shelter with spirit was founded in 2005 by Gary and Linda Citron. Gary and Linda have been long standing patrons of the exemplary work of the "Rural Studio," which is an architectural outreach program run by Auburn University. to infuse projects with a bold aesthetic. Shelter with spirit is an exempt organization under section 501 (c)(3) of the Internal Revenue Code. Contributions to Shelter with spirit are deductible under section 170 of the Internal Revenue Code. Shelter with spirit, P.O. Box 153130, Austin, TX, 78715-3130. Privacy: Shelter with spirit respects your right to privacy; therefore, we do not sell or lend our mailing list of supporters to other organizations or marketing campaigns. If for any reason you wish to be removed from our mailing list, please contact our office. ©2005-2016 Shelter with spirit. All Rights Reserved. Socially responsible architecture for the economically disadvantaged.